This is my 8th GLORIOUS trip to the Hacienda. And, I am honored & very excited to be invited back to teach in 2019! I work with each student individually to guide YOU through your own unique process. 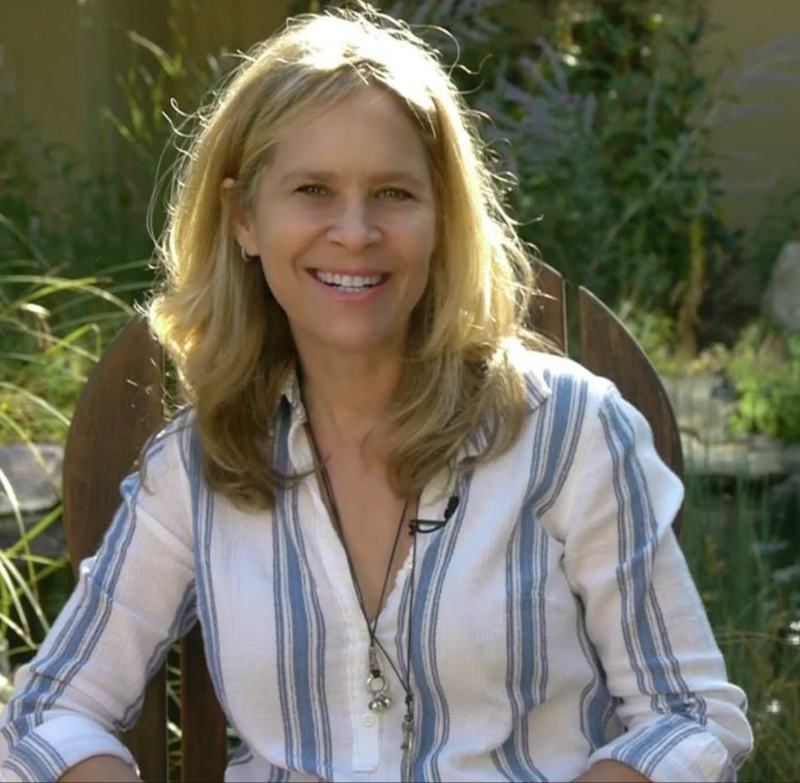 This art retreat is all about YOU & what you want to learn from ME. For new students this is the perfect opportunity to learn all of the basic mosaic skills and so much more! All students are welcome to CREATE THEIR OWN WORKSHOP and work on personal projects of any scale. 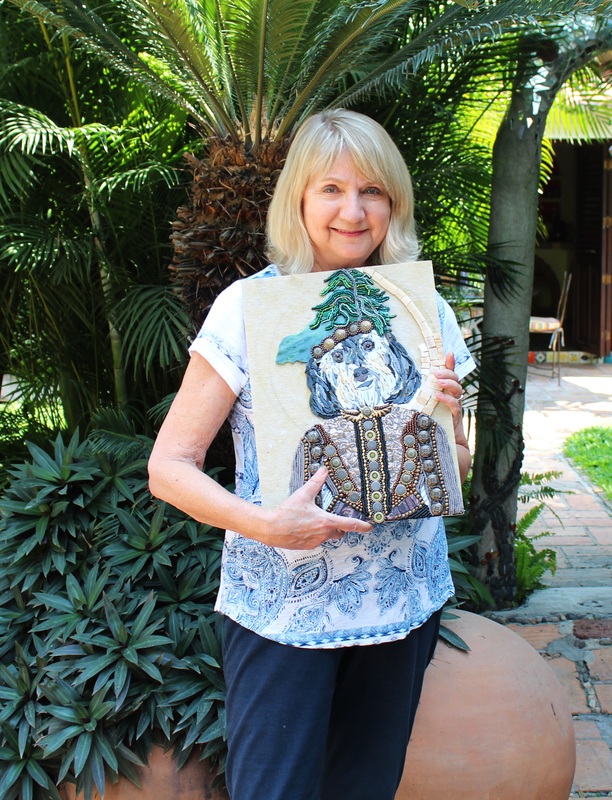 I will work with students one-on-one IN ADVANCE to ensure you arrive at the Hacienda with appropriate materials you will need to create a one-of-a kind keepsake art piece. 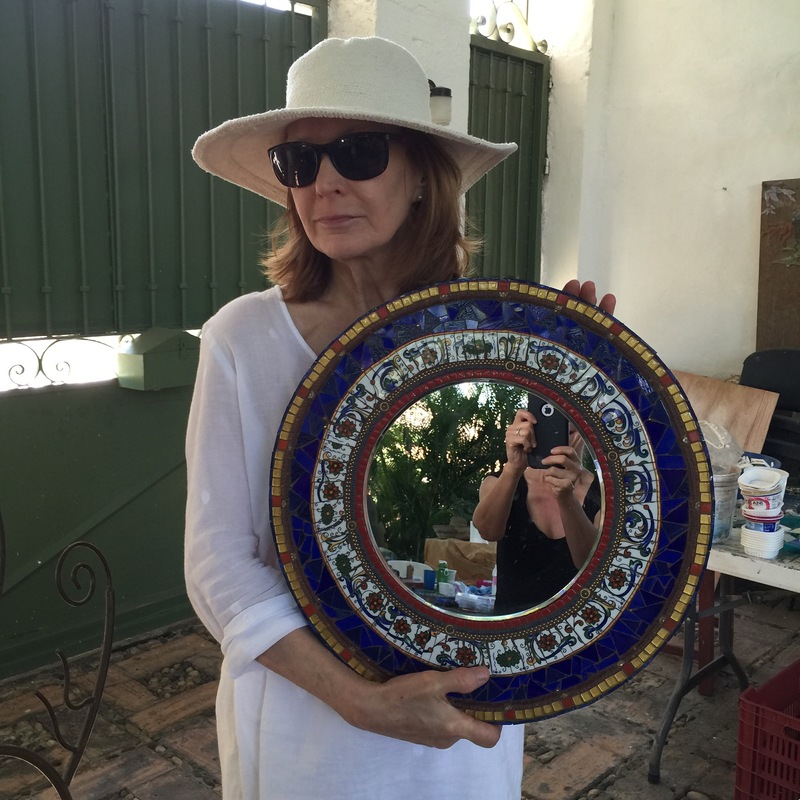 Susan’s Masterclass, is all about YOU ! 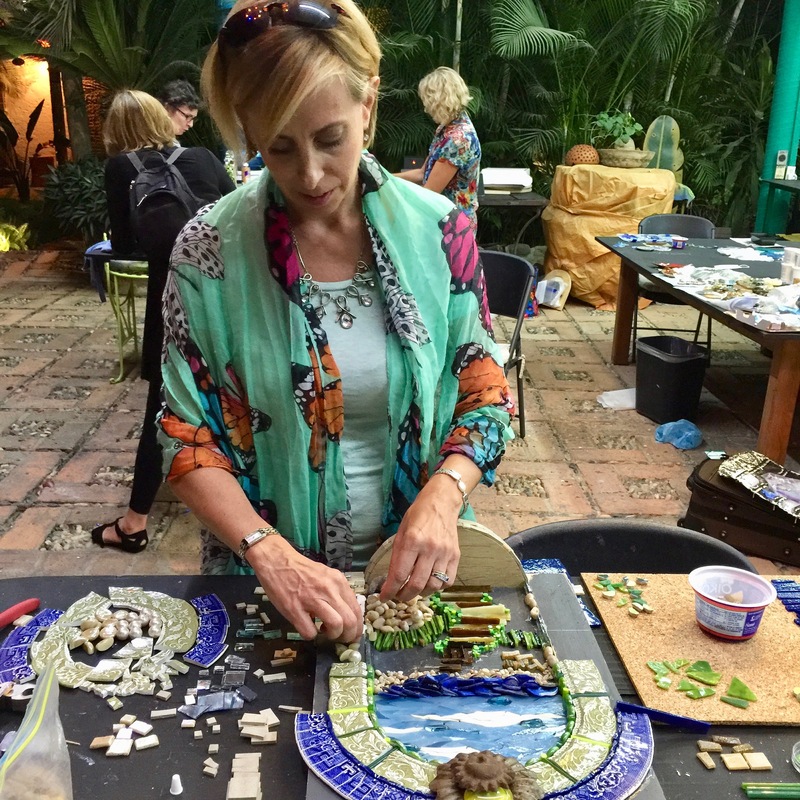 Once you register she will work via email to design and build your dream substrate in which to create a mixed media mosaic. There is no generic supply list, everyone will have a project and materials unique to what they want to create. The class begins as soon as you register. We will work together through email and phone calls to create your substrate and gather your palette so you will be all set as soon as you land in this inspired paradise. 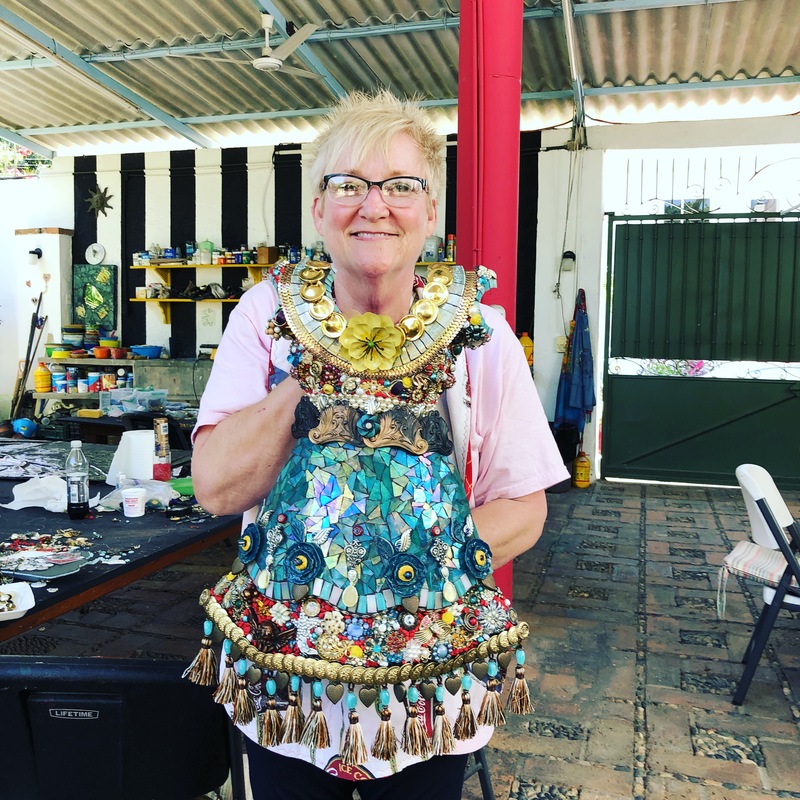 Don’t worry, I will show you how to gather discarded treasures and other one-of-a-kind materials as well as what tools you will need to bring. My mosaic process begins by you choosing a substrate that excites you. 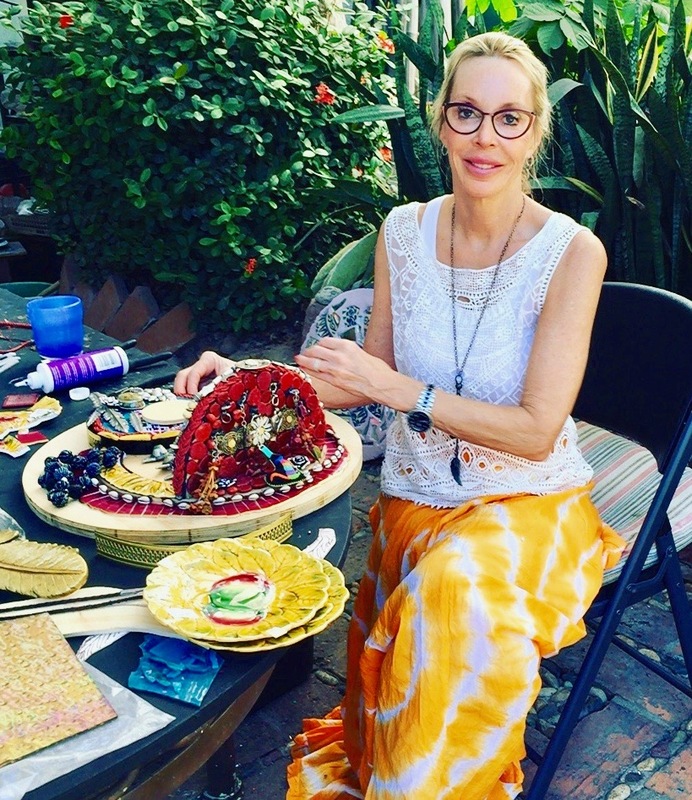 My Signature pieces are my MOSAIC DRESSES and my SACRED SHRINES. But I am happy to build you a one-of-a-kind substrate, just email me your ideas and together we will come up with the perfect project just for YOU! ALL SKILL LEVELS ARE WELCOME. MOSAIC EXPERIENCE HELPFUL BUT NOT NECESSARY. Workshop fee includes 5 days instruction, 6 nights of lodging, breakfast and lunch on workshop days. Unlimited use of the studio 24/7. Instructor will provide your substrate & appropriate adhesives. 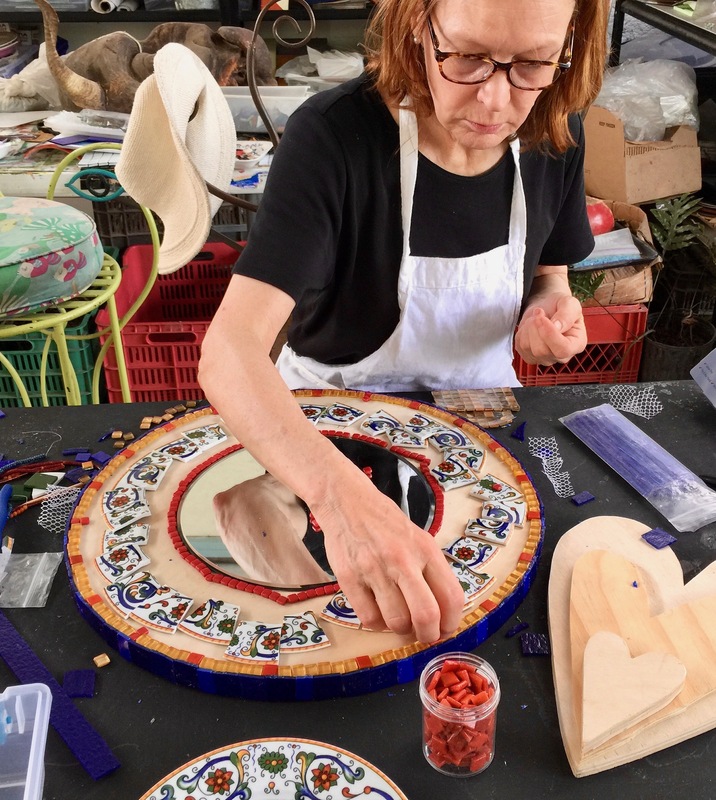 Students must bring their own mosaic hand tools. A $500 deposit is required to reserve your spot. Students are invited to a Hacienda hosted welcome reception on Sunday evening, February 17. 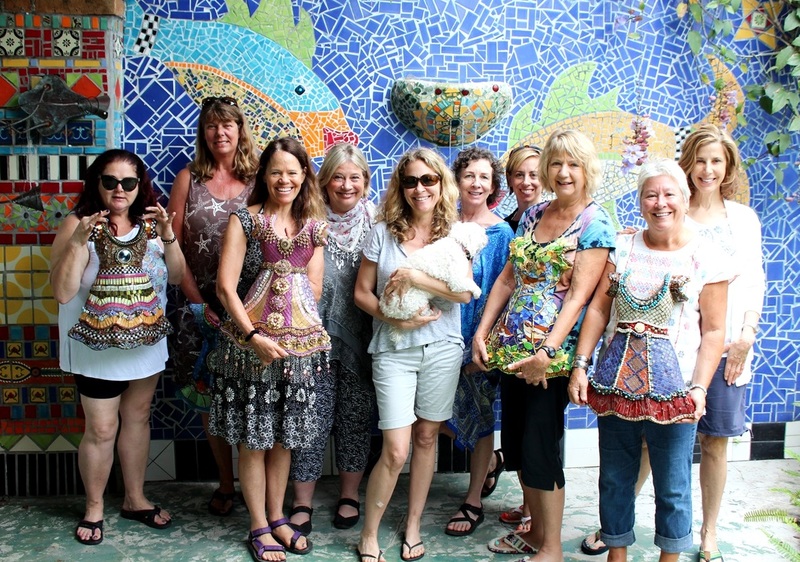 During our week together there will be tons of learning and lots of free time to explore Puerto Vallarta, shop or relax. Students depart Saturday, February 23. My creative mind works quicker than my hands; I always have lots of visual images swimming in my head. I work on a lot of pieces all at the same time, therefore I have created a process in which I work and that process is also how I teach. Every piece begins with me gathering my palette from tons of china and discarded treasures that I have collected all of my life. From there I simply surrender to the process and let the piece unfold. My mom has always been my biggest influence in my life. I have a BFA from the University of Michigan and a MFA from NYU in costume design. 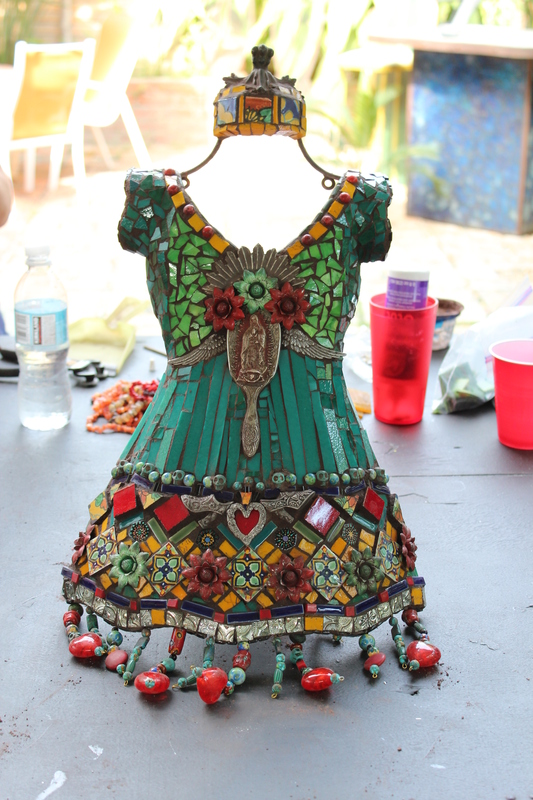 So it was my mom’s suggestion that my signature pieces should be mosaic dresses. When I saw hanging in a craft store, half of a dress in a metal form, I was inspired. I bought 50 to make a series. I teach all over the globe now because I love sharing my creative process and empowering others with their own creative voice. It is very satisfying to me to share what I love to do. I learn as much from my students as they learn from me. Together we build a safe community. Once you take a class from me you are forever part of a very special group of creative souls that I call my Mosaic Warriors. Welcome to the club! Please feel free to call me with any questions – I talk better than I type.